In honor of St. Patrick’s Day, Zack Dennis puts together a collection of Irish drinking songs to match the stories in James Joyce’s Dubliners. Like many disgruntled sophomores who automatically hated any reading that was explicitly assigned, I muddled through a few of the stories in James Joyce’s “Dubliners” during English class. I can’t claim that the stories made any particular impression on me (I found them too depressing) but they captured the attention of my friend Jeff to such a degree that he devoted his higher education to the study of the author. Jeff’s dissertation, titled “James Joyce: The Einstein of English Fiction,” was about the influence of relativity theory on “Ulysses” and “Finnegan’s Wake.” It’s a pretty complicated topic, but one that’s a fitting tribute to the incredible complexity of Joyce’s prose. “Dubliners” was Joyce’s first major work and the stories take place exclusively in Dublin, the city of Joyce’s birth. The city was so familiar to Joyce that in describing his most famous work “Ulysses” he once claimed that he wanted “…to give a picture of Dublin so complete that if the city one day suddenly disappeared from the earth it could be reconstructed out of my book.” The geographical references in “Dubliners” are so distinct and detailed that a similar claim might be made for these stories. The collection of tales follow a progression in point of view from childhood, to adolescence, to adulthood, eventually culminating in death. 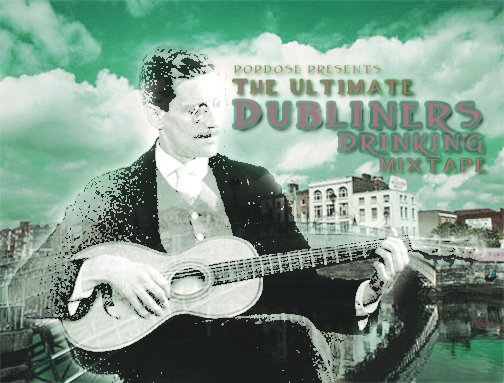 After last year’s Ultimate Drinking Mixtape was so well-received by all the drunks in the neighborhood, I figured I’d try it again with a slightly different theme – songs that matched the themes of the stories in Joyce’s “Dubliners.” This wasn’t an easy mix to make. Keeping the songs matched with the spirit of the stories while still pulling together a coherent and enjoyable mixtape to drink along to proved to be a difficult pair of tasks to resolve. I did my best, and I hope you’ll enjoy it. If you’ve got the ingredients, please mix yourself a “James Joyce,” kick back, and have a wonderful St. Patrick’s Day.